Very dear and deserving friends of ours recently adopted a baby girl. I wanted to make a blanket for her in celebration. After digging through piles of quilt patterns I found one called Lily. The amaryllis bulb is my favorite of those in the Lily family. The angles were right, the pattern simple but lovely—and the pattern lent itself well to my purpose. But instead of quilting it, I knit it. This garter stitch baby blanket is the result. 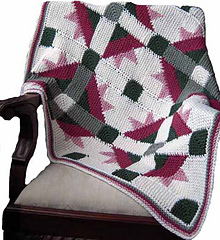 Blanket is knit in narrow columns or panels. 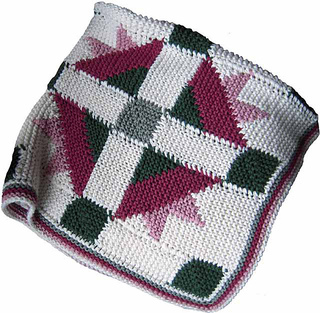 Each panel is 8 to 16 stitches wide, and is joined to the previous one while knitting. 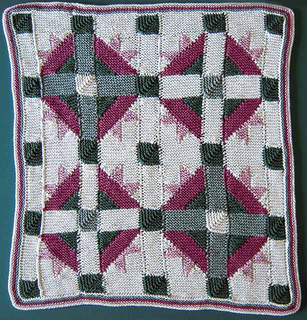 Once all panels have been knit, the border is worked in the round. 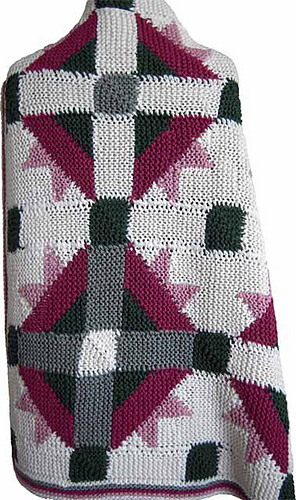 No sewing or seaming is involved in creating this blanket. This pattern is sized as a baby blanket. Blanket could easily be made bigger by increasing the number of repeats in either direction. after washing 35 x 31.5 inches (89 x 80 cm). Yarn: DK weight: 920 yards of A, 345 yards of B, 345 yards of C, 230 yards of D, 345 yards of E; yarn used doubled throughout. Bulky yarn can be substituted, and worked with one strand at the same gauge; fewer yards required. Skills: Intarsia, picking up sts along an edge, color charts, knitting in the round..
Other supplies: 6 stitch holders required; stitch markers are optional.